Native in southern Michigan and Menominee Co. in or near prairie remnants (including roadsides and fencerows), at margins of swamps, and in dry open ground. Most northern occurrences represent garden escapes or other waifs along roadsides or in rocky fields. 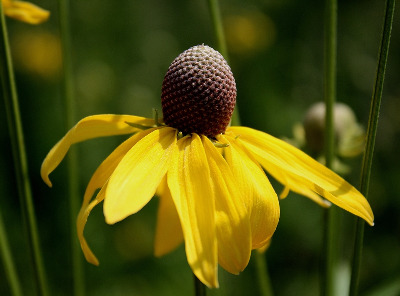 Specimens of Rudbeckia laciniata with drooping rays might be mistaken for this species, but differ in the essentially glabrous stems and peduncles and the greenish to brownish disk. Other Rudbeckia species with purplish disk and pubescent stem may have to be checked carefully for absence of chaff at the base of the ray flowers if they are puzzling; see also note under Rudbeckia. MICHIGAN FLORA ONLINE. A. A. Reznicek, E. G. Voss, & B. S. Walters. February 2011. University of Michigan. Web. April 19, 2019. https://michiganflora.net/species.aspx?id=434.